Attention globetrotters! This photo challenge theme is for you! Well, it’s for anyone, of course, but since our Sunday Stills theme this week is “Objects Over 100 Years Old,” your photos from countries abroad will likely showcase places and spaces that have been around for over 100 years. Just be careful about publishing images of artwork, sculptures and paintings, because the objects are copyrighted, even though you took the photo with your own lens. I doubt the image police are going to find you if it’s something you do infrequently. Some of you are adept at portrait photography like fellow blogger, Lucile de Godoy, who specializes in street and portrait photography. Perhaps she has photos of objects or folks over 100 years old! I, myself, don’t photograph a lot of architecture, although now that I sometimes post for Thursday Doors, I try to look for interesting doors when I’m out and about. I say this because I cheated a little for this theme and borrowed one of my daughter’s photos of her trip to Greece. In the featured image above, this is the Church Zoodochos Pighi, Megalochori, on Agistri Island, Greece. Yes, I know I need to get out more, and by that, I need to get out of the US…one of these days. For now, I must rely on historic cemeteries, California missions or downtown churches to meet the criteria of this theme. The photo was taken in the Masonic Cemetery in the town of Michigan Bluff in the Sierra Foothills in 2014. The California Gold Rush of 1849 brought hoards of homesteaders, prospectors and fortune-seekers from South America, Asia and the U.S. East Coast. Many died young from various illnesses, as their headstones reflect the dates of their lives and deaths. 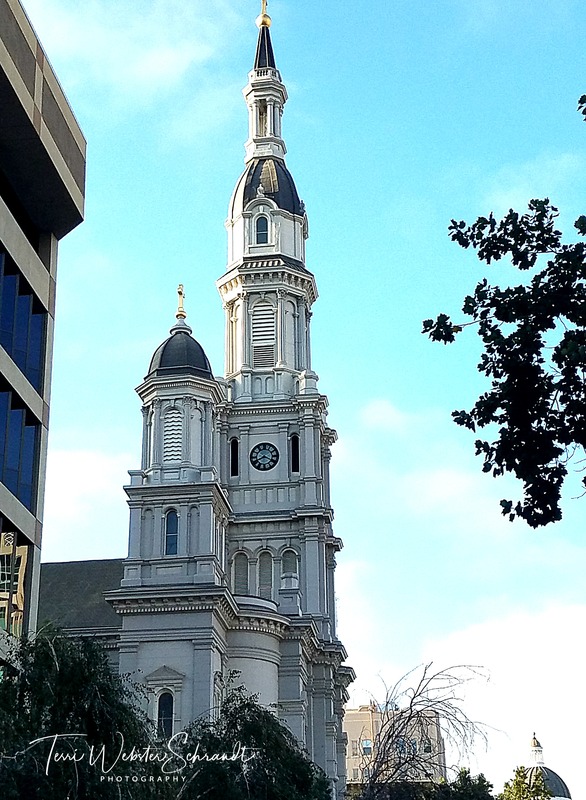 Construction on this Catholic church in downtown Sacramento began in 1887. You can see the top of the California State Capitol Building at the bottom right of the image. For a shot of nostalgia, here is a older post I did for the original Sunday Stills, showing a photo of Sunday Stills: San Diego Presidio. My annual plug to celebrate the National Park Service, which celebrated its 100 years of service in 2016. My photo of the fridge magnet, artfully framed with pine needles. So there you have it. Whether you have a photo of something over 100 years-old or an image that represents age, be creative and show us what you’ve got! Many folks have also submitted wonderful poetry or flash fiction to further depict the Sunday Stills theme of the week! Thank you for your participation! Please link up or link to this post so I can share your selections! Hi my friend, thanks for the shoutout. You’re very kind and supportive to us and our community. It is people like you who inspire me every day to continue blogging. Thanks for your care and friendship. I came back from holidays and will join your challenge. Thanks! Anytime! I miss seeing you and your photos, Lucile!! I love it Lucile, the post and the photos were wonderful! You can still link if you want. I imagine you are busy getting situated! It’s been a crazy busy week! fun, but totally crazy ! I’ll shoot for tomorrows challenge 🙂 How is your week? How is the smoke up there? Smoke is a lot better, at least here at the delta, where the wind can blow it away. I’m heading back to Sacramento later this morning, so we’ll see how the air is. At least the Temps have been in the mid-80s! Looking forward to see what you have for water!! Mid 80’s that sounds so wonderful!!!! It’s three digits here. Thanks for stopping by Diana! Sometimes those headstones will read what they died of. Always fascinating! All the pix are wonderful. The headstones make me sad, thinking of lives cut short. The one guy definitely made a cathedral! It’s beautiful! I think you found a lot more than you thought you would before writing this! When I first visited California in 2001, I loved visiting Mission Dolores! I also got to visit an old gold rush town! There is so much interesting history in this country. You’re right, Aixa…I dug through a bunch of older photos and was surprised. Sacramento Gold country has a very rich history and the area is close-by! You can link up to Sunday Stills anytime! That cemetery looks very autumnal, Terri. I stopped visiting them ever since I started to notice that the first grave I got to would always have my birthdate as the date the person passed away. Kinda freaked me out a little. Sometimes, things even frighten me. Love the historic buildings you’ve taken the photos of. Spectacular. Always makes me wonder how much hard work must have gone into erecting those buildings, considering they didn’t have most of the tools we now have. It was autumn when I took that photo. I always thought that area would make a spooky place for a Halloween party! That’s pretty creepy, Hugh, to see that date (sounds like a story in the making)! I think cemeteries and churches are interesting visually and historically. Back in England, I liked to walk to old villages that often had a church dating back hundreds of years. Even the simplest had something of interest, something unique to them. A walk I used to do in Cornwall took me to a village that consisted of a church and a pub which served a rural community. The church had a book listing the sponsors of the vicar or reverend of the parish. One sponsor was Queen Elizabeth and not the current one either. Here’s my offering on the theme: https://grahamsisland.com/2018/08/19/an-old-abandoned-anchor/. Thanks, Graham! I’m sure England has some stories to tell! I learned that European churches erected cemeteries on the same grounds, unlike most US churches today. Hi I went to my trip pictures as soon as I saw your title. Didn’t notice the your suggestions. I really appreciate your story of the history of Patrick Monogue. California does have some interesting history. Hah…too bad my mom isn’t 20 years older…then I could include her in this! !